52/5 (p), 52/10 (p), 52/15 (p), 53/1 (p), 53/6 (p), 53/11 (p). 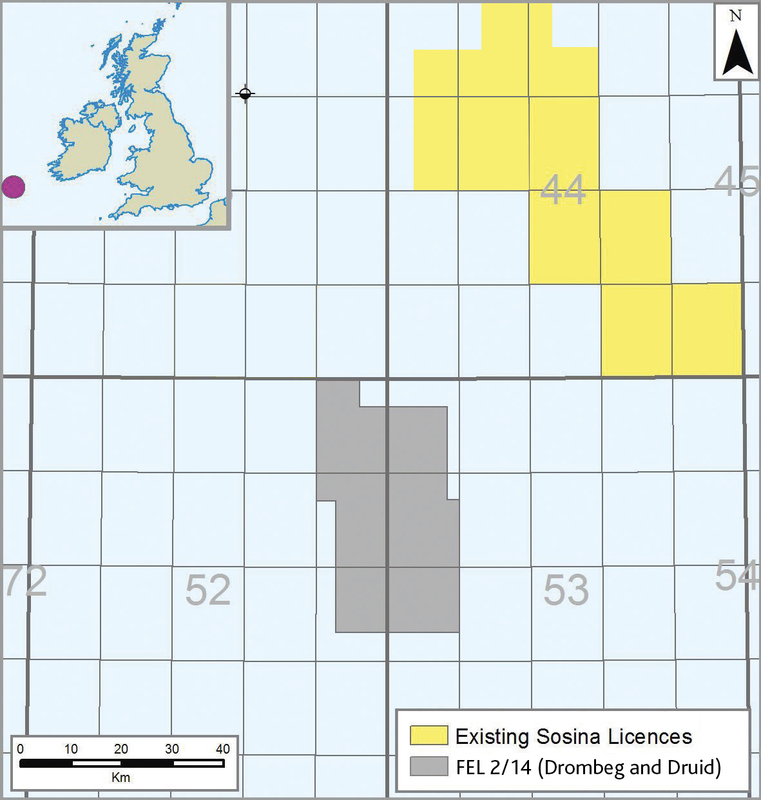 FEL 2/14, which is located in the southern Porcupine Basin off the south west coast of Ireland, was awarded to Providence Resources (80%) and SOSINA (20%) in October 2011 as part of the 2011 Irish Atlantic Margin Licensing Round. In April 2014, LO 11/9 was converted into FEL 2/14 with the same working interests. During the initial pre FEL 2/14 authorisation phase (LO 11/9, from 2011 through to 2013), the joint venture identified two large vertically stacked Paleocene (?Druid?) and Lower Cretaceous (?Drombeg?) fan systems with notable Class II amplitude versus offset (AVO) anomalies primarily from previously acquired 2D seismic data in 2008. The joint venture subsequently agreed to licence part of a multi-client 3D seismic survey over the area. This 3D survey was acquired by Polarcus in the summer of 2014 and was subsequently processed by ION Geophysical in 2014/15. Having completed the processing of the 3D data, Providence/SOSINA in September 2015 entered into an exploration collaboration agreement with Schlumberger in respect of the southern Porcupine and Goban Spur Basins. Over a 6-month period, a multi-disciplinary team of 30 technical professionals from Providence/SOSINA and Schlumberger worked on this project focusing on the primary technical disciplines of Geology, Geophysics, Geomechanics and Petroleum Systems Modelling. With thousands of man-hours involved, this project was designed to confirm prospective resource potential as well as helping to mitigate risk at both the basin and prospect levels. In April 2016, the first results of the Collaborative Project were announced which confirmed the significant resource potential of Druid and Drombeg, with multi-domain analysis confirming that the 3D seismic responses from the Druid and Drombeg prospects are consistent with the presence of two large vertically stacked stratigraphically trapped oil accumulations. The results of the study confirmed total cumulative inplace un-risked prospective resources of c. 5.095 BBO (PMean) for Druid and Drombeg. Two fans located c. 1,750 m BML and structurally up-dip from a potential significant fluid escape feature from the underlying pre-Cretaceous Diablo Ridge. Cumulative in-place un-risked prospective resources of 3.180 BBO (PMean). o Fan 1 ? 984 MMBO (PMean). o Fan 2 ? 2,196 MMBO (PMean). Pre-stack seismic inversion and regional rock physics analysis shows Druid is consistent with a highly porous (30%) and high net-gross, light oil-filled sandstone reservoir system up to 85 metres thick. A depth conformant Class II AVO anomaly is present and synthetic forward modelling of an oil-water contact correlates with the observed seismic response. Spectral decomposition, seismic compactional drape and mounding are reflective of a large sand-rich submarine fan system with no significant internal faulting and clear demonstration of an up-dip trap mechanism. Geomechanical analysis using regional well and high resolution seismic velocity data indicates that Druid is normally pressured and the top seal is intact. Located c. 2,750 m BML and structurally up-dip from a potential significant fluid escape feature from the underlying pre-Cretaceous Diablo Ridge. In-place un-risked prospective resource of 1.915 BBO (Pmean). 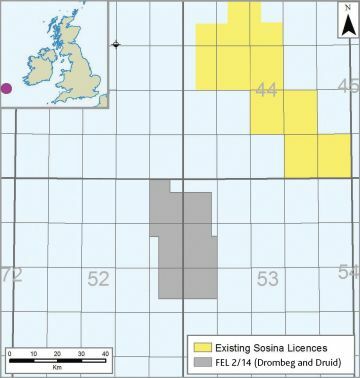 Pre-stack seismic inversion and regional rock physics analysis shows Drombeg is consistent with a highly porous (20%), light oil-filled sandstone reservoir system up to 45 metres thick. A depth conformant Class II AVO anomaly is present and spectral decomposition is reflective of a large sand-rich submarine fan system with no significant internal faulting, and supports an up-dip trap mechanism. Geomechanical analysis using regional well and high resolution seismic velocity data indicates that Drombeg is over-pressured with an intact top seal.